Remove silver skin and remaining fat from pork tenderloin. Cut tenderloin in the middle without getting to open more than one side. Leave extremities closed so cheese doesn’t escape when cooking. Dice cheese and stuff inside tenderloin. Season with salt and pepper. 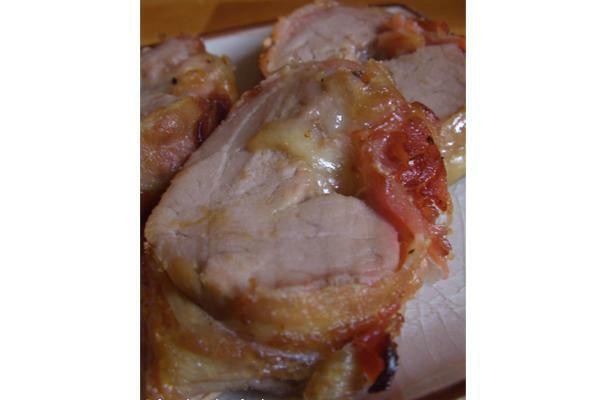 Wrap bacon slices around pork filet mignon and tie it up with kitchen string. Dispose wrapped tenderloin in an ovenproof dish. Pour a dash of olive oil, add salt and pepper and bake in oven until bacon looks crispy and inside is entirely cooked.